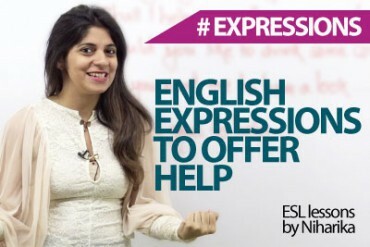 In this English Video lesson, Niharika teaches you how to talk about movies and films with your friends and folks.You will learn useful vocabulary and sentence structures to talk about movies in English. It was heart warming and a total laugh riot. It made my blood run cold. Casting –The selection of actors or performers for the parts of a film. Veteran – A veteran is a person who has had long service or experience in the film industry. Dubbed – To translate the movie into regional languages. Sub-titles – captions displayed at the bottom of a cinema or television screen that translate or transcribe the dialogue or narrative. Cinematography -the art of photography and camerawork in film-making. Trailer – a series of extracts from a film or broadcast, used for advance publicity. Sequel -A film or movie that continues the story or develops the theme of an earlier one. Cameo -A cameo role or cameo appearance is a brief appearance or voice part of a known person in a work of the performing arts, typically unnamed or appearing as themselves. Block buster- A particular a film that is a great commercial success. Bombed- A particular a film that is not successful. 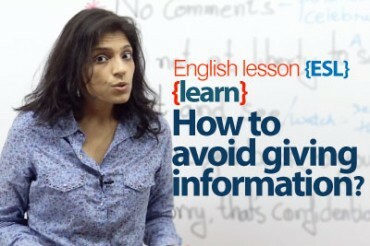 How to avoid giving information? English Expressions. 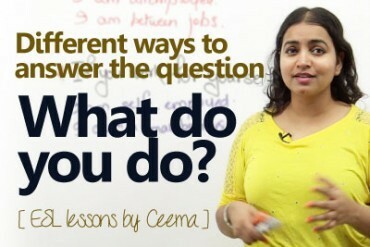 How to answer the question – What do you do? I have watched the movie ‘2 STATES’ and it was heart warming.